The mists of the Kakabeka Falls reveal a rainbow. 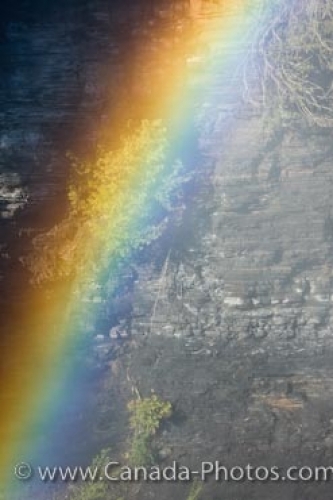 The rainbow appears above the falls. Behind the rainbow and the mist is the rocky ledge. A few trees grow out of the ledge. Rainbow in the mist above Kakabeka Falls (aka Niagara of the North) along the Kaministiquia River during a spring flood, Kakabeka Falls Provincial Park near Thunder Bay, Ontario, Canada. A misty blur reveals a rainbow showing its wonderful colors above the Kakabeka Falls.